They could take away everything else except our songs, which meant we kept our souls. – Bernard Lafayette, Freedom Rider. 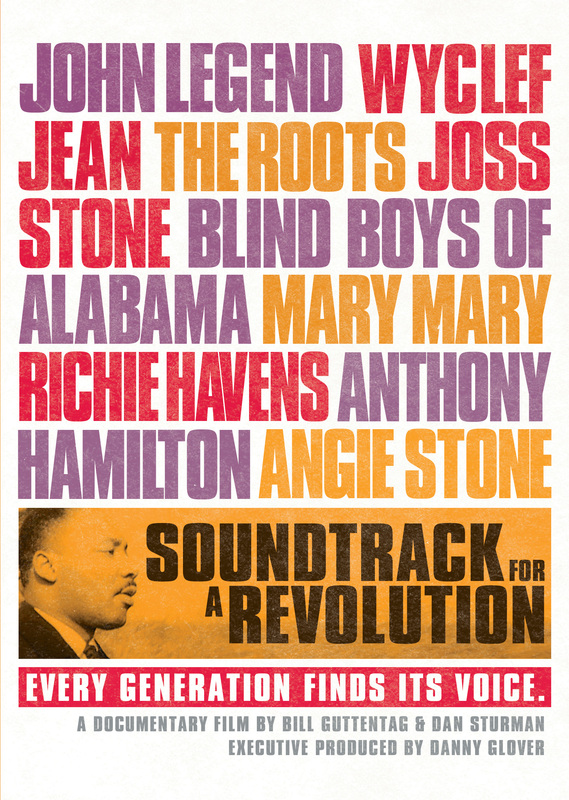 A fresh and exhilarating take on one of the most important social movements in American history, SOUNDTRACK FOR A REVOLUTION explores the civil rights struggle through the powerful and stirring songs that inspired a generation. Directed by Bill Guttentag and Dan Sturman (Nanking), produced by Louverture Films, and executive produced by Danny Glover, SOUNDTRACK FOR A REVOLUTION is a vibrant blend of heart-wrenching interviews, dramatic images and thrilling contemporary performances – an award-winning film of energy and significance. SOUNDTRACK FOR A REVOLUTION conveys the power of music: the freedom songs protestors sang on picket lines, in mass meetings, in police wagons, and in jail cells, as they fought for justice and equality. The film features new performances of iconic songs, such as “We Shall Overcome” and “Wade in the Water,” by top contemporary artists including John Legend, Wyclef Jean and The Roots, alongside interviews with civil rights foot soldiers and leaders, including Congressman John Lewis, Harry Belafonte, Julian Bond, and Ambassador Andrew Young. Freedom songs evolved from slave chants, from the labor movement, and especially from the black church. The music enabled African Americans and others to sing words they could not always say, and it was crucial in helping protesters as they faced down brutal aggression with dignity and violence. The infectious energy of the songs swept people up and empowered them to fight for their rights. Bill Guttentag is a two-time Oscar®-winning documentary and feature film writer-producer-director. His films include the documentary features Nanking, which premiered at the 2007 Sundance Film Festival, and SOUNDTRACK FOR A REVOLUTION, which had its international premiere at the 2009 Cannes Film Festival. He wrote and directed the dramatic feature Live! starring Eva Mendes and Andre Braugher. In 2003 he won an Oscar® for the documentary Twin Towers. Other honors include three additional Academy Award® nominations, two Writers Guild Award nominations, three Emmys, and a Peabody Award. His first novel, Boulevard, was published by Pegasus Books/W.W. Norton in 2010. He created and executive produced the NBC series Law & Order: Crime & Punishment, which ran for three seasons (2002-2004). He also teaches at Stanford University. Together with Bill Guttentag, Dan Sturman wrote and directed the Sundance, Emmy, and Peabody award- winning documentary film Nanking and produced the Academy Award®-winning documentary Twin Towers. His work has appeared on ABC, CBS, Comedy Central, VH1, Channel 4, Cinemax and NBC, where he produced three seasons of the primetime series Law & Order: Crime & Punishment. Prior to making documentaries, Sturman worked as a broadcast journalist, reporting and producing for ABC News, CBS News, and the BBC while based in Los Angeles; for Reuters and NBC News while based in London; and for ABC News 20/20 in New York. 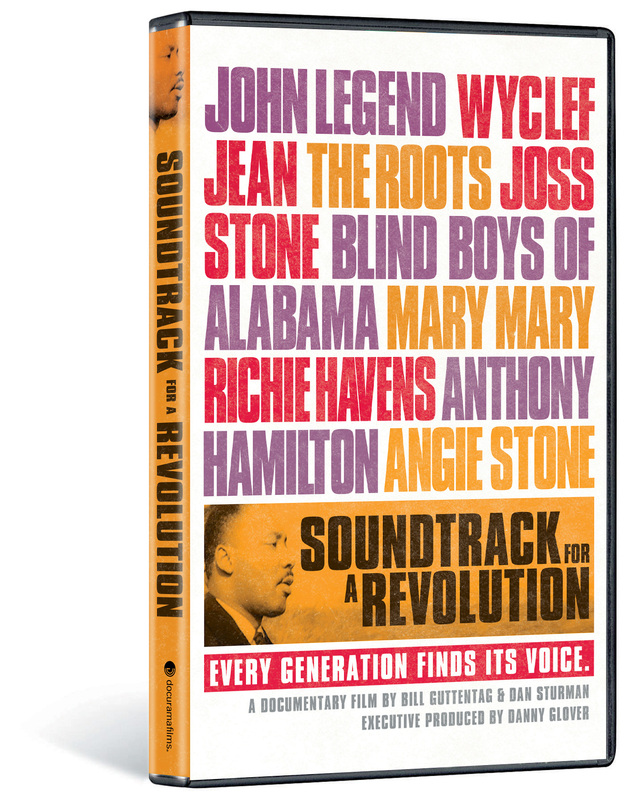 SOUNDTRACK FOR A REVOLUTION will be distributed day-and-date with the DVD (September 28) on video-on-demand (VOD) and on digital platforms via New Video’s partners.